In fiscal year (FY) 2011, federal agencies obligated $31.4 billion to 1,134 academic institutions for science and engineering activities, according to a new report from the National Science Foundation’s National Center for Science and Engineering Statistics. 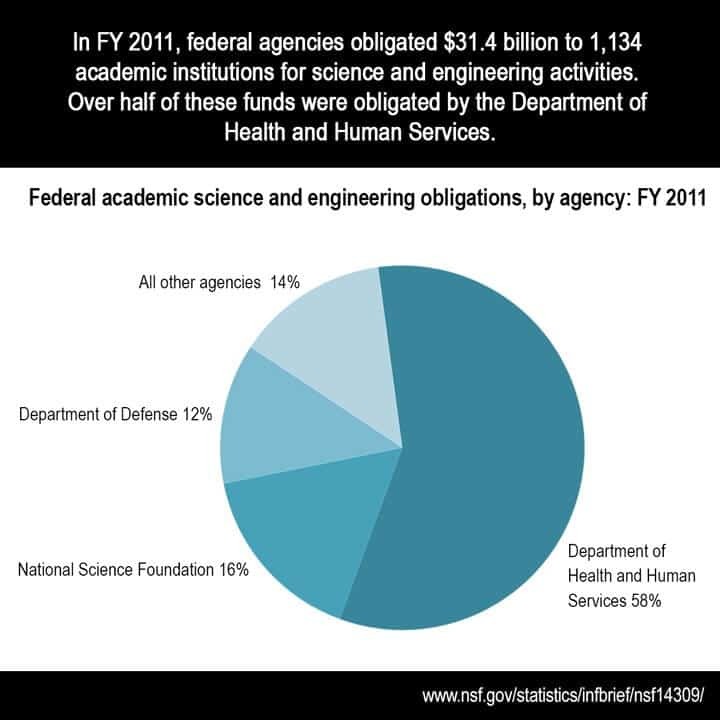 The FY 2011 obligations represent an 11 percent decrease in current dollars from federal obligations to academic institutions for science and engineering activities in FY 2010. In FY 2010, federal obligations were $35.3 billion to 1,219 academic institutions. The decrease reflects the absence of American Recovery and Reinvestment Act (ARRA) of 2009 stimulus funds in FY 2011. The last ARRA funds were obligated in FY 2010 and accounted for $5.1 billion, or 14.5 percent, of FY 2010 science and engineering obligations to academic institutions. If ARRA obligations are excluded from FY 2010 totals, FY 2011 science and engineering obligations to academic institutions increased $1.2 billion or 4.1 percent. For more information on this report, please contact Michael Yamaner. Please visit the NSF’s National Center for Science and Engineering Statistics for more reports and other products.